The picornaviruses represent a diverse and well studied family of RNA-containing animal viruses. In addition to having a simple structural organization and a limited size plus-strand RNA genome, members of the family constitute a significant group of human and animal pathogens. 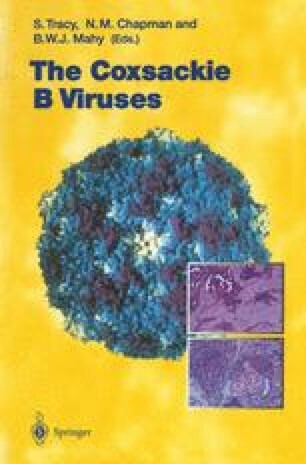 The coxsackie B viruses (CVB), which belong to the enterovirus genus of Picornaviridae, have long been recognized as the causative agents for a number of human ailments frequently involving the heart. Infection of neonates with CVB commonly occurs and can sometimes result in severe consequences. The tissue tropism of these and other viruses has long been thought to be controlled at least in part by the interaction of surface residues on the virus with specific cellular proteins found on the membrane of the target cells. The binding of the virus to these cellular proteins, which act as receptors, results ultimately in the entry of viral nucleic acid into the target cell through processes that are poorly understood (Rossmann 1994).